When you’re trying to keep your food budget down, you need some frugal shopping tips up your sleeve to save the maximum amount of money. If you’re feeling particularly short of money one week or month, have a look around at home – you might find that you barely need to do any shopping at all.Make an inventory of all the food you have in your cupboards, fridge and freezer and highlight any foods that are about to go off. Consider whether they can be frozen or how they can be used quickly. With the items on your inventory see how many meals you can come up with – you’ll probably be surprised at how far the food will go. You may well find that you only need to buy a handful of fresh items such as milk, fruit and vegetables. Always use a shopping list, unless you are extremely disciplined and can meal plan on the go. Having a list will prevent you from impulse buying and throwing in little extras which all add up. Keep a list in the kitchen and add to it when things run out. Use meal plans to form the basis of the list as well. 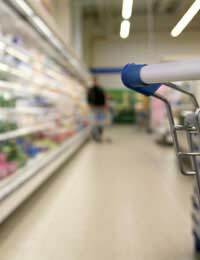 Some dedicated frugal shoppers will price check items and go to several different shops to save the most money on their food shopping. However, for many people this just isn’t practical or desirable. There are still ways to shop smart though. It’s worth checking out discount supermarkets as the savings can be huge and many of these shops are widely praised for the high quality of their goods. Some people find that they save the most money by shopping online. You will pay extra for delivery (although look out for discount and free delivery codes), but it is much easier to avoid the temptation of veering from your list when you shop online and you can see discounts and offers at a glance. Don’t go shopping when you’re hungry either – go after you have had a meal or a snack. Otherwise you are likely to end up throwing all sorts of unnecessary goods into your trolley. If you’re looking to be economical with your monthly food budget, avoid processed foods and branded items. Cooking from scratch and using supermarket and value goods will save you and absolute fortune. Stock up on cheap, nutritious store cupboard staples such as canned beans, canned tuna, tinned tomatoes, pasta, rice, frozen vegetables and soups. Use discounts, vouchers and tokens to get as much money off your shopping bill as possible – only use them for items you would buy and use anyway. Avoid taking kids shopping to the supermarket. They have pester power and tend to sneak all sorts into the trolley. Only buy what you need. If you only need a tiny amount of a certain food, such as a few lentils or a pinch of herbs, it might be cheaper and less wasteful to go to a weigh house where you only pay for what you need.